Twas’ just a few months ago and I was a Wikipedia newb. Sure, I’ve used Wikipedia as a means of learning and reference for years, but I’ve never taken that step to become an editor. Becoming a Wikipedia editor is not only a great way to give back to a community you most likely have taken from for years, but can also “up your rep” in many different ways. 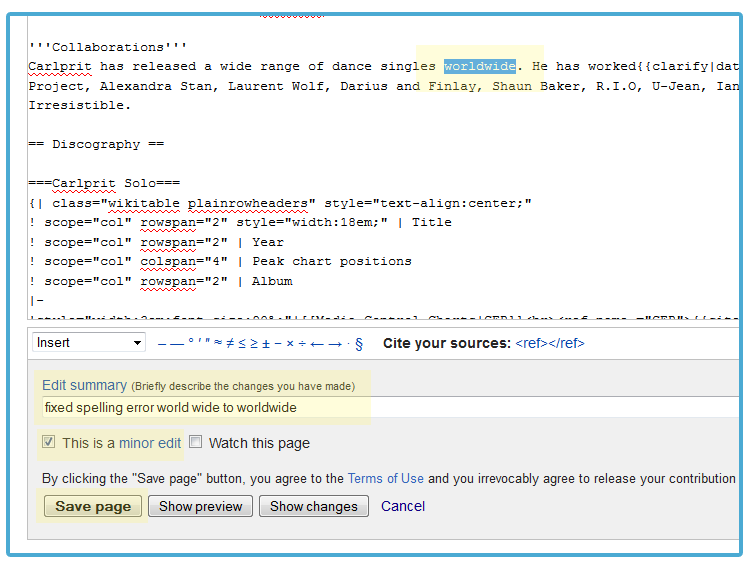 Whatever your reasons are, here are the most basic steps to becoming a Wikipedia editor. Once you are signed up, confirm your email and log in. One of the easiest ways to get started as being an editor of Wikipedia is to go to the page “Wikipedia articles that need editing.” In case you haven’t guessed, this page is a list of Wikipedia pages that are tagged with copy, grammar, or spelling errors. Once you’ve navigated to that page, find a page that you know at least something about. It might be a little difficult at first but even a page that you’ve heard of will work. Once you’ve navigated to the page, one trick I like to do is “select all” then paste all of the text from the page into Microsoft Word. From there Word will find any spelling and grammar mistakes. “World wide” is actually spelled “worldwide” so that is one quick mistake I can fix. FYI – this is the Wikipedia article I’m talking about. Next, use “Ctrl + F” to find the mistake that you are looking for, and fix it. Just change the word you found in the text editor, you don’t have to do anything fancy. Minor changes are spelling, grammar and other small stuff. Major changes would be rewriting the George Bush Wikipedia Page to Mickey Mouse. When you click “save” you will see your changes take effect live. Practice doing this a dozen or so times. Try to find more complex grammar errors, capitalization errors and other spelling errors. It is important to get comfortable with the absolute basics of Wikipedia editing before you go creating a Page, making major changes, creating links, or citing references.